197 pages | 76 B/W Illus. For machine intelligence applications to work successfully, machines must perform reliably under variations of data and must be able to keep up with data streams. Internet-Scale Pattern Recognition: New Techniques for Voluminous Data Sets and Data Clouds unveils computational models that address performance and scalability to achieve higher levels of reliability. 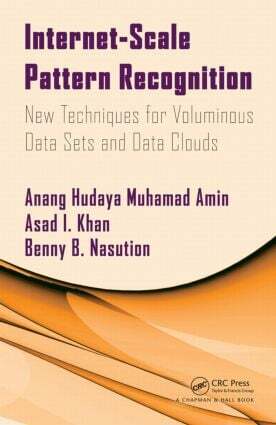 It explores different ways of implementing pattern recognition using machine intelligence. Based on the authors’ research from the past 10 years, the text draws on concepts from pattern recognition, parallel processing, distributed systems, and data networks. It describes fundamental research on the scalability and performance of pattern recognition, addressing issues with existing pattern recognition schemes for Internet-scale data deployment. The authors review numerous approaches and introduce possible solutions to the scalability problem. By presenting the concise body of knowledge required for reliable and scalable pattern recognition, this book shortens the learning curve and gives you valuable insight to make further innovations. It offers an extendable template for Internet-scale pattern recognition applications as well as guidance on the programming of large networks of devices. Anang Hudaya Muhamad Amin is a senior lecturer in the Faculty of Information Science and Technology at Multimedia University in Malaysia. He received a BTech (Hons.) in information technology from Universiti Teknologi PETRONAS and a masters in network computing and PhD from Monash University. His research interests include artificial intelligence with specialization in distributed pattern recognition and bio-inspired computational intelligence, wireless sensor networks, and distributed computing. Asad I. Khan is a senior lecturer in the Faculty of Information Technology at Monash University. Dr. Khan is an Australian Research Council assessor and has published over 80 refereed papers. His research areas include parallel computation, neural networks, and distributed pattern recognition as well as the development of e-research systems and intelligent sensor networks. Benny Nasution is with the Department of Computer Engineering at Politeknik Negeri Medan. Dr. Nasution was awarded the IBM Award from Tokyo Research Lab and the Mollie Holman Medal from Monash University.